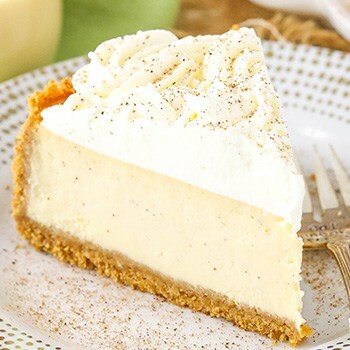 This Eggnog Cheesecake is thick, creamy and full of eggnog! It’s a delicious way to enjoy one of my favorite drinks of the season and was a huge hit with friends and family. One of my favorite ways to enjoy milk this time of year is in the form of eggnog! I could probably drink my weight in the stuff. I love it! And there’s more than 1 full cup of it in this cheesecake. To start, there’s the classic graham cracker crust – with a little twist. To give it a touch of holiday fun, there’s some nutmeg. It gives the crust a little more flavor and goes perfectly with the eggnog. Next up is the cheesecake filling. It’s my classic thick and creamy cheesecake with a full cup of eggnog and a bit of nutmeg. One thing to keep in mind when baking the cheesecake is that it does bake a little longer than some. The eggnog thins out the batter a good bit, so the baking time is increased. Although baking takes a while, it’s totally worth it in the end! On top of the cheesecake is some eggnog whipped cream, because is there such a thing as too much eggnog? I think not! Sprinkle on a touch more nutmeg and a few pearl sprinkles and you’re all done and ready to dig in! I shared this cheesecake with lots of family and friends and it was such a HUGE hit! Some were getting a little protective over it and I thought perhaps someone might throw down over the last piece. I hope you love it as much as we all did! Combine the crust ingredients in a small bowl. Press the mixture into the bottom and up the sides of the springform pan. Add the eggnog and nutmeg and mix on low speed until well combined. Pour the cheesecake filling into crust and spread evenly. Bake for 1 hour and 30-40 minutes. To make the whipped cream, add the heavy whipping cream, eggnog and powdered sugar to a large mixer bowl. Whip on high speed until stiff peaks form. Remove the cheesecake from the pan, then pipe the whipped cream onto the cheesecake. I made little rosettes with Ateco tip 844, but feel free to decorate as you like. Sprinkle with a little nutmeg and pearl sprinkles, if desired. Refrigerate the cheesecake until ready to serve. Cheesecake is best for 3-4 days. 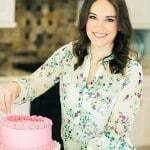 Lindsay is the author, blogger, recipe developer and photographer behind Life, Love and Sugar. She has a serious sweets addiction! Lindsay grew up with a love for creating and a big sweet tooth. Her cookbook, Simply Beautiful Homemade Cakes, features her gorgeous cake recipes. Bring on the sugar!